Princess Aurora is one of the most iconic roles a ballerina can perform during their career. 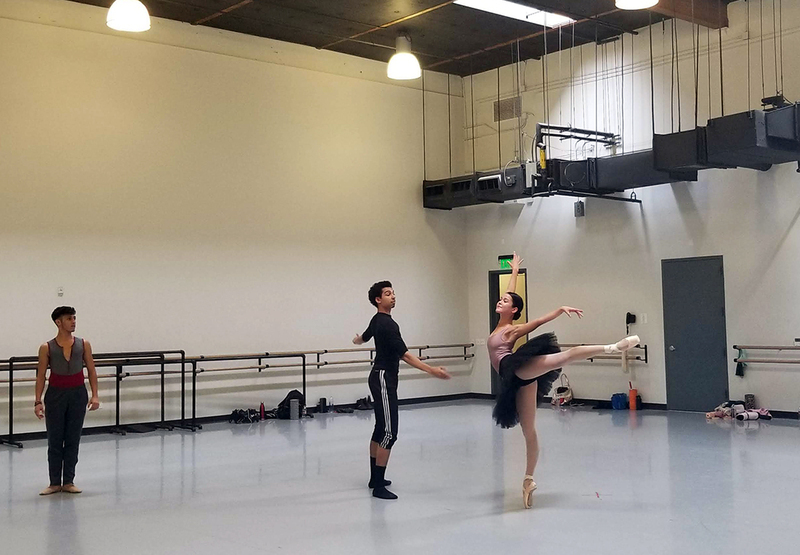 So we sat down with Ballet Arizona company dancers Jillian Barrell, Arianni Martin, and Mimi Tompkins, all of whom will take the stage as the fairy tale princess in The Sleeping Beauty this weekend, October 25th – 28th at Symphony Hall! Mimi Tompkins as Princess Aurora in ‘The Sleeping Beauty.’ Choreography by Ib Andersen. Photo by Alexander Iziliaev. This is 2nd time dancing the role of Aurora for all of you. How has your approach differed this time around and how do you prepare for a role like this? Jillian: I think no matter who you are or what stage you are in your career, Aurora is a difficult role. But when I performed the role for the first time in February 2012 it was a very big challenge for me. So I’m extremely grateful and excited to have the opportunity to come back to again with more experience under my belt. Arianni: My first time was not as pleasant as I wanted because I was suffering from an injury. For this second time I already feel different but in a good way, the steps are automatically in my body, so I will try to enjoy it to the fullest. Of course the consecutive rehearsals are the best form of preparation, after that I just remember the corrections and I put them into practice. Mimi: Well this time, I know I can do it. Last time I wasn’t sure, it was the second full length principal role I had ever done and it’s literally the most challenging role for a female. It was really daunting and I had never been more nervous to perform than that first time on stage as Aurora. This time I don’t have that raw nervousness, I am more mature as a dancer, and I really love this role, she is very young and fresh. That’s how I felt my first time doing it so I still want to channel that feeling again but now I want to make more of a difference in the three acts and showing the progression of Aurora as a woman. To prepare, I do watch other dancers for inspiration. One of my all greatest inspirations is Sofiane Syle of San Francisco Ballet, she was my mentor when I was at the school, and she is just technically perfect. Can you walk me through the technical side of Aurora and why it is known as one of the most difficult? Jillian Barrell and company dancers in rehearsal for ‘The Sleeping Beauty.’ Choreography by Ib Andersen. Jillian: The role of Aurora is both technically and physically demanding. I think that’s part of what makes it so hard – you have all of this really difficult dancing to do but you have to do it when your body is fatigued. The first act is probably the most demanding stretch of the ballet. By the time you prick your finger and collapse at the end of the act, you can’t feel your legs and you entire body is pounding. Arianni: It is a very difficult role, technically and emotionally, and one of the most difficult roles I have done in my life. I don’t think I am the only one who feels this way. It requires a lot of concentration, especially rose adagio with all of the balances on one leg, it’s a challenge for any female dancer. Mimi: It’s so difficult because it’s so simple. 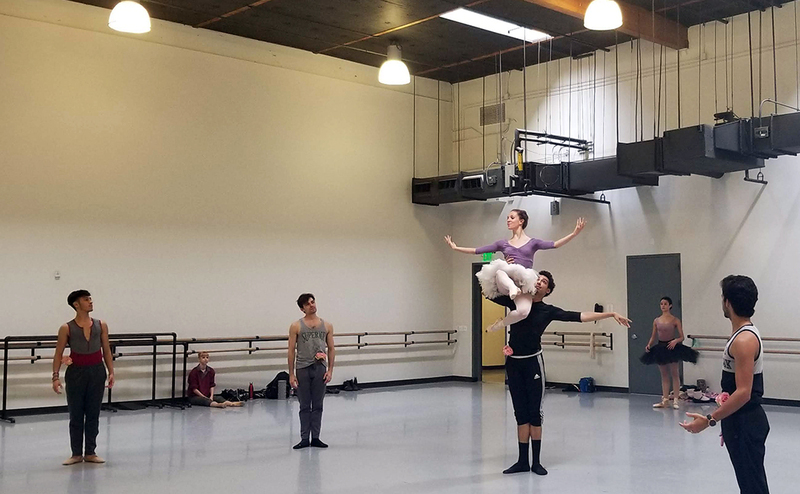 For other classical ballets like Swan Lake, there is set choreography, but there are different ways to do the port de bras and if you’re a little off you can go with the flow. With The Sleeping Beauty, there is only one way to do things, and if you don’t do it that way, it is so obvious. As Ib says, even if you don’t know ballet and something does go off, you will know, which is what makes it so daunting. And for parts like the Rose Adagio, the littlest thing will throw you off, if the boy has his hand a little bit weird – it completely pushes you off balance. You have to be solid and focused throughout the whole ballet. Storybook ballets incorporate more than just good technique and acting is a big part of what makes the dancer believable. Do you have any tips? Jillian: Character and acting are such an important part of dancing. Without it, nothing really makes sense. No matter what the role, I think it’s important to have a sense of the personality of your character. I try to think about what I’m trying to say with each step, each port de bras. That way you’re not just moving around, you’re communicating something to the audience. The role Aurora sort of has three distinct personalities, which is fun. In the first act she is youthful and bubbly and excited. In act two she appears as a vision: soft and strong at the same time, calling out to Prince Desire, perhaps a little restless from her 100 year sleep. And in act three she is regal and elegant and calm. Arianni: The acting for me is what makes this role so difficult. To become the character and make people believe it is a challenge so concentration on the role is the most important thing I can do. Mimi: First act to me is the most intricate with the acting. She comes in 40 minutes to the ballet already starting, it’s her birthday party and she is this young, fresh, sprite girl who is now presented with choosing a suitor. I love this part because it’s the hardest technically but what helps me get through it is the acting. I think about myself as a 16 year old at my birthday party, thinking about what love is and who I am as a woman, and I don’t really know because I am so young and naive, it’s just so exciting. But it’s also draining, since first act is so demanding. This will be the third time I’ve died on stage, you’re literally so exhausted but you have to go into this rigor mortis position for about 5 minutes and all you want to do is collapse but you have to keep you feet pointed. Overall I look at it as first act is more spontaneous and second and mostly in third I am in control. It’s the day of the performance, do you have any rituals to help you prepare? Mimi Tompkins and Ethan Price in rehearsal for ‘The Sleeping Beauty.’ Choreography by Ib Andersen. Jillian: The prep for a performance really depends on what I’m dancing. I don’t really have a ritual before a show. I try to just do whatever my body and mind needs that day. However, it’s not uncommon for me to be sewing a pair of pointe shoes in the morning! I always try to make sure I’ve fed my body well and I like to activate my core before taking warm up class. After class I do hair and makeup, I stretch and roll, and I usually do a final bit of prep for my pointe shoes. And although this may sound strange, I do always like to brush my teeth before I leave the dressing room! Between acts I am changing costumes and headpieces and pointe shoes. If I have time I’ll roll out or stretch a bit. The amount of care I need post performance again depends on what I’m dancing. But rolling out my quads and hamstrings and releasing my psoas are always a must! And a good meal and a glass of wine never hurt anyone either! Arianni: The nerves are going to be there for sure, but once you go to the stage all that disappears, between each act there is only time to change custom and practice or concentrate. Days before the show I try to eat very well to have good energy and also I take care of myself physically. Mimi: It’s so much anxiety. I usually wear a new pair of pointe shoes, so if I haven’t already I sew them, and I always have a few pairs as back up. I basically just trip out all day, thinking about if I ate enough and and slept enough. I always get there early and spend a lot of time doing my hair and makeup, because I am a perfectionist, but it also helps me feel centered and in control. I kind of have a routine, I listen to music in my dressing room and have a million little things in there to feel comfortable. I don’t really practice day off, obviously I stretch and warm-up in class, but I don’t want to stress even more and have to trust that I’ve done it in rehearsal and you just need to believe in yourself. Can you talk about the importance a role like Aurora has on a dancer’s career? Jillian: Aurora is a significant role for a ballerina because roles that push you and stretch you are so important. Those experiences are often when you grow the most as a dancer. Mimi: It’s important because it’s the hardest. It’s the most classical ballet and in my opinion classical ballet is the hardest to do because it’s so exact and you can’t hide behind anything. So if you can accomplish that, you are one of few that can and to have the technical ability to do it is a huge feat as well. Nayon Iovino as Prince Desire and Arianni Martin as Princess Aurora in ‘The Sleeping Beauty.’ Choreography by Ib Andersen. Photo by Alexander Iziliaev. This is such an interesting blog. Thank you Jill, Arianni and Mimi for sharing a part of your journey as Aurora! I wish you the very best as you dance this iconic role!